Kiana is a 60ft vessel, purpose built for Diving the Great Barrier Reef. Owner/skipper Geoff Brenton is an extremely experienced dive master who has extensive knowledge of diving the best locations in and around the Whitsundays. Kiana has ample deck space and below deck is air-conditioned and beautifully fitted out for maximum comfort. This is a fully equipped vessel for diving with the bonus adequate space for gearing up before exploring the beauty of the underwater world. Kiana is fully equipped for both snorkelling and scuba diving so all you need to bring is a smile. Kiana has an onboard high capacity dive compressor so your diving will not be limited to the number of spare scuba tanks that can be carried as is the case with most sail and dive vessels. Kiana carries a maximum of 14 passengers ensuring that our guests are never crowded. 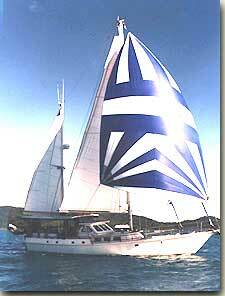 Our crew consists of a qualified Skipper, Dive Instructor and Cook/Deckhand. A crew of three ensures that Kiana’s guests never lack attention. All meals are prepared on board Kiana from fresh ingredients. Our unique “marine hangi” (pronounced hungy) will satisfy the gourmet within you. The Hangi is a traditional New Zealand Maori method of cooking in an earth oven. On Kiana we have adapted this concept with our own marine version. Being a deep draft vessel Kiana is particularly roomy below decks. Air-conditioning provides comfortable temperatures in the heat of the tropics. The quality of Kiana’s teak finish provides an ambience that cannot be matched by the plastic alternatives. Kiana has single and double accommodation in shared cabins. If you require more privacy we have private twin cabins available for a small extra charge. Kiana has two large bathrooms with electric toilets and freshwater showers. Our high capacity hot water system ensure that hot water is always available. Kiana has many extras that help to improve the quality of your adventure. 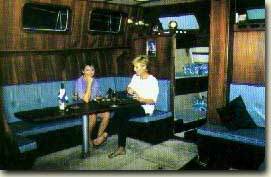 For example Kiana’s galley is fully electric with a dishwasher and microwave/convention oven. And we even have a Clothes Dryer onboard for those days where you need a dry towel. The tropical sun can be very severe, particularly on those with fair skin from cooler climates. Kiana provides the best of both worlds with ample deck space for sun baking and a huge permanently shaded rear deck where you can cool off. The rear deck also provides protection from the elements on those rare occasions when there is a tropical rain shower.